I’ll never forget the first time I went to the cinema in London on the weekend. My mum had come for a visit and really wanted to see Cuban Fury. Traipsing our way across town to the only cinema still screening it – we were a bit late to the party on that one – we duly queued to buy our tickets. The look on my mother’s face when the cashier said “That’ll be £28 please” will be forever etched in my mind. “There’s only two of us” Mama T responded, visibly aghast. “What do you get for £28? Do you get a cup of tea with your ticket?” Unfortunately not. I digress. Taking a trip to the cinema in the big smoke can work out a pretty costly affair so I opted to take advantage of the EE 2 4 1 film offer on Wednesday where as the name suggests, you get 2 tickets for the price of one. (This offer is due to end on 25th February so if you are an Orange or EE customer make the most of it while it lasts.) That said, the film we went to see was so amazing I’d go as far as to make a second visit to the flicks to see it again. Now there’s an endorsement that should be on the poster. 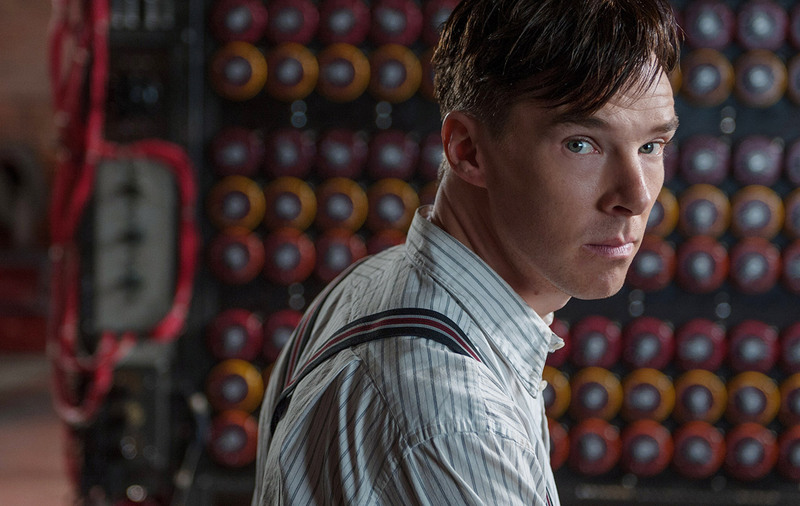 I am of course talking about The Imitation Game. Shining a light on the life and work of an unsuspecting mathematician named Alan Turing who’s exceptional code breaking skills helped the Allies win World War Two – saving an estimated 14 million lives in the process. Everyone’s favourite Sherlock, Benedict Cumberbatch stars as Turing and despite his character’s often abrasive and emotionless manner I definitely developed a fondness for him. An outsider dating back to his childhood, Turing struggled to make friends and fell victim to severe bullying from boys that could never dream to match his brains. He forged a strong bond with classmate,Christopher and we see Turing reminisce about their friendship throughout the film. Cumberbatch’s portrayal of the unlikely war hero is poignant and absolutely worthy of the actor’s recent Oscar nomination. Also up for an Academy Award is Keira Knightley who plays Turing’s colleague and friend, cryptanalyst Joan Clarke. The film boasts an all star cast from Downton Abbey’s Allen Leech to Hollywood heavyweight Mark Strong but that’s not why you should go and see it. After the end of World War Two the codebreakers attempted to pick up the lives they had put on hold while working at Bletchley Park. Of course, their part in ending the war became classified for decades and the true scale of what they achieved was only fully revealed, (well, as fully as MI5 would disclose), in 2009. In 1952, despite the huge contribution Turing made to bring the war to an end, he was convicted for indecency for practising homosexuality. He was sentenced to probation and hormone therapy – more commonly known as chemical castration- for one year. The alternative was prison. His name was dragged through the mud in an attempt to humiliate his person and discredit his work. A year after he completed his ‘therapy’ Turing was found dead in his home, a half eaten apple by his bed and a ruling of cyanide poisoning in his blood. The coroner determined suicide. He was 41 years old. It blows my mind that gay men – like the estimated 75,000 who were convicted in the UK before homosexuality was decriminalised – would have been subjected to the same stigma and punishment as criminals for acting on a human desire for intimacy between consenting adults. The work Turing did during the war set the wheels in motion for the creation of the technology I am using to write and publish this today. Can you imagine how much more his incredible mind would have achieved had his life not been cut so tragically short? If you haven’t already entered my January Giveaway click here for details. Glad to hear it get recommended! I’m so looking forward to seeing this movie! There are advertisements for it plastered all over the city of Munich where I live, and I am just waiting waiting waiting to finally watch it!